Byrdy Galernik dribbles. The sophomore guard started the game on Saturday against Missouri State. Last year, with then-seniors Christen Inman, Lauren Douglas and Ashley Deary each scoring at least 10 points, Northwestern beat Missouri State 75-52 in Evanston. This year at Missouri State, things went differently. The Bears stormed out to an early 19-8 lead and never looked back, picking apart the Wildcats en route to a dominant 90-59 victory. Once again, NU (6-6) struggled to take care of the ball, committing 21 turnovers on the day. Part of the problem stemmed from missing freshman guard Jordan Hamilton, who sat out the game with an injury. 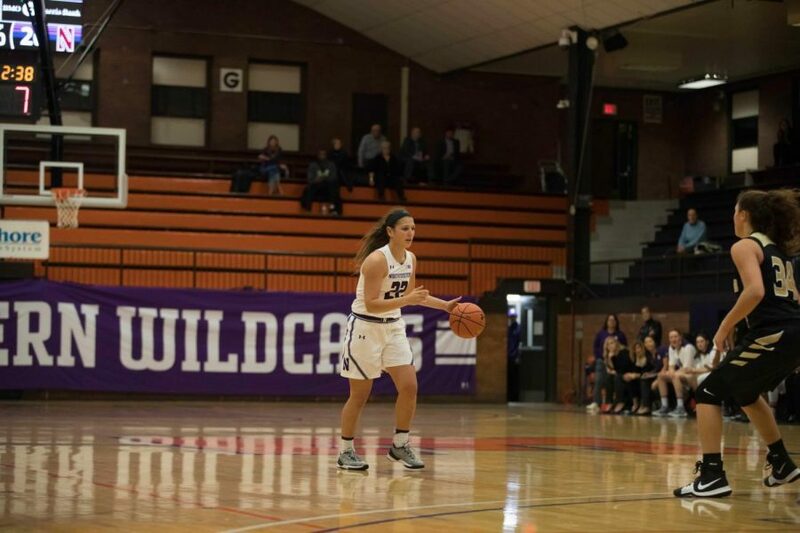 Sophomore guard Byrdy Galernik, who was pressed into starting duty, committed only one of those turnovers, but sophomore forward Bryana Hopkins was forced to handle emergency backup point guard duty, committing five turnovers. Freshman guard Lindsey Pulliam, NU’s leading scorer on the season, was forced to take on more ball-handling duties as well. Pulliam finished 3-for-13 from the field and committed four turnovers. Due to all the turnovers, Missouri State took 16 more shots than the Cats, and shot a better percentage as well. The Bears finished the day shooting 52 percent from the field, including 15-for-26 from 3-point range. Missouri State guard Alexa Willard led all scorers with 21 points, missing only one of her nine field goal attempts while also shooting 3-for-3 from behind the arc. Senior guard Lydia Rohde led the way offensively for the visiting Cats, scoring 19 points and shooting 5-for-7 on 3-pointers. Beyond Rohde, however, the Cats struggled in almost every way. In addition to their superior shooting numbers, the Bears grabbed more rebounds, had more assists, committed fewer turnovers and had more bench points. NU never led in the entire game, which was tied for only 47 seconds. The Cats, who have now lost five of their past six games, are back in action on Tuesday when they host Green Bay at Allstate Arena.